In an op-ed in Quartz this past August, I wrote about some of the things we grapple with at Outernet when we think about how to fill the shelves of Humanity’s Public Library. The conclusion reached very quickly is that there are no right answers, only better answers, and “better” is limited to the information available. Outernet is a truly revolutionary service that fills an important gap in global data accessibility. Every one-way service passes through an editorial filter before it reaches its audience, as do many two-way services as well. On the Internet, there is no upper limit to what you could post on your website. The New York Times could theoretically turn their website into an enormous blog that posts everything. They do not because there is an expectation of quality from visitors to the New York Times and quality is a very fine filter. Furthermore, while the Internet may not provide a physical bandwidth constraint, humans provide one with our attention span. But Outernet is not the Internet, and this is critical in understanding how Outernet works and the thinking behind our editorial decisions. 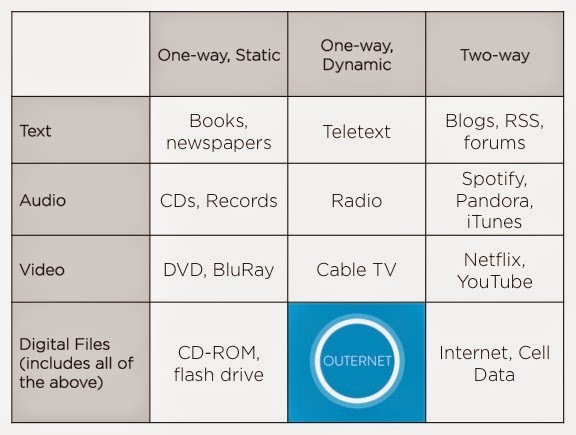 Outernet is subject to the same constraints as the other one-way dynamic types of broadcasts: instead of airtime on radio or TV, our limit is the bandwidth we are able to beam from our satellites in orbit. The pipe through which we deliver content has a finite diameter, which necessitates an editing process to make sure what bandwidth we do have is used most effectively. Whenever there is a small group making decisions on behalf of a larger group, it is important that the processes are transparent and the parameters for decisions well understood by all. 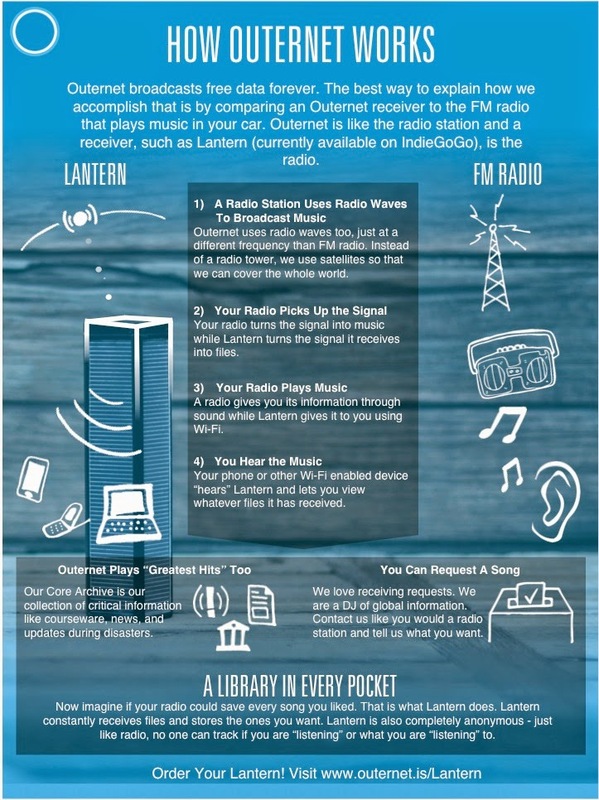 For this reason, today Outernet has published a comprehensive set of guidelines covering how content is broadcast over Outernet as well as our first round of content sources for what Outernet curates. I encourage you to read both documents and make comments and suggestions. I will be hosting an AMA on Reddit on 12/19 at 2:30pm EST and have created an Editor’s Corner section of the Outernet forum that I will check in on regularly. For the selection of Outernet’s curated content, we rely on our Core Principles as guides and require that any piece of content broadcast on Outernet, including sponsored content, fulfill one or more of our Content Goals. Free access to information is a human right. No one should be denied a basic level of information due to wealth, geography, political environment, or infrastructure. Every person should be able to participate in the global marketplace of ideas, and, consequently have a say in what Outernet broadcasts to the world. The process of curating what Outernet broadcasts should be transparent in its execution and involve the input of Outernet’s constituents. Education. A work should enable a user to be a more informed participant in society and/or aid in moving them towards a higher plane of knowledge. Truth. A work should be true and support the right of the public to truth. Transparency. A work should allow a user to have greater understanding of the institutions that affect their daily life. Empowerment. A work should give a user an enhanced ability to manipulate the course of their life towards their intended goal. Health and Safety. A work should provide the required information to lead a healthier, safer, and ultimately more enjoyable life. Quality of Life. A work should either directly or indirectly provide a means for a user to improve their quality of life. Below I have summarized some of the issues we contended with in creating this document and the stand we have taken. Finally, I want to emphasize that this is a living document. When we say we are Humanity’s Public Library, there is deliberate emphasis on the first word. This system cannot function without a committed group of users. Thank you for being involved! Outernet broadcasts to everyone with a particular emphasis on those who have limited alternative means of receiving critical information. The more inclusive we are in our editorial process, which happens online, the more we move towards a system where those with Internet are deciding what those without read. While Outernet employees fall into this group, we are bound by our mission while random Internet users are not. Current fix: User requests cannot be voted on, only the content picked to best match the request can be voted on; Transparency and general willingness to revise curated content and pathways for that content to be changed by Outernet users; Dedicated information targeted at offline populations. We value free speech immensely and see Outernet as a way to fight against those who would suppress free speech. However, the things that free speech enables individuals to say can naturally upset the values of others. If Outernet were to become associated with the fringe, offensive aspects of its content, it could make the entirety of Outernet taboo in offended areas and prevent more universally lauded content from reaching those who need it most. This is of particular concern in areas that are disconnected and would have no other means of accessing information. Current fix: Creation of Outernet Content Goals and requiring that anything broadcast on Outernet fulfill them; Any piece of content broadcast on Outernet may be commented on and reviewed by the community. When we receive a request from a user, we want to turn around a piece of content to fulfill that request in a very timely manner. At the same time, Outernet staff do not have the time to personally review every request, nor would that be the most inclusive approach. The diverse members of the Outernet community often can find a better answer than we would and sometimes it takes time and discussion for that answer to surface. We also want to avoid the misuse of Outernet, whereby an ill intentioned community member might select nefarious content for broadcast and it moves through the queue too quickly without a chance to be noticed. Current fix: Certain content, like news and updates related to disasters, are prioritized and broadcast by Outernet as part our curated selection; Moderators may prioritize content requests when appropriate; every request, once matched with content, endures a minimum 24 hour period of public review. Current fix: Minimizing the hegemony of English content; Providing a news source for every nation on Earth in that country’s major language; where possible, additionally providing a source of news that serves a minority group, typically through language; broadcasting active petitions and/or movements that are ongoing, especially those serving underrepresented groups; categorizing content not only by country but by language and ethnicity and assessing content curation by those standards. Specifically regarding the user management of content requests, we struggled with wanting to make the minimal level of input very accessible (e.g. voting without creating an account) while not impeding committed users by excessive participation by trolls or spam users. The system should cater to those who are novices in online community projects as well as those who are advanced users. Current fix: Requiring a free, basic account be created for participation in content selection; Giving weight to voting, but not making votes the sole decider in content selection; increasing accountability as a user earns more privileges in the Outernet community; Moderator verification before any content gets broadcast. For a look at how User Requested Content works, see this diagram. For greater explanation, you may look in the document itself. The 25% Rule. Sponsored content will never take up more than 25% of the total content being broadcast by Outernet. Due to the nature of satellite datacasting and the functioning of our data carousel, this figure may be exceeded for a given span of time, however the working distribution of data will be kept below an average of 25%. Content Review. All sponsored content, like any other content broadcast on Outernet, must fulfill one of our Content Goals and adhere to our Broadcast Standards and Goals. Visual Demarcation. In the condensed content display, sponsored content will be differentiated in its visual presentation. For further discussion of any of these topics, please refer to the entire set of Broadcast Guidelines. We also need assistance in building up the curated content for each nation, so if you have a source for a particular country that you think be a part of Outernet’s regular broadcast, please submit it here. Thank you for your support and I look forward to receiving your feedback.